Paphos is one of the most popular sightseeing destinations in Cyprus and it continues to attract more and more tourists who enjoy its beautiful setting and archaeological treasures. 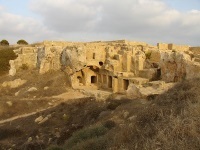 Visitors will find a lot to see and do in Paphos, if they can tear themselves away from the stunning beaches. 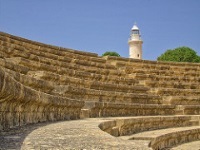 Near the Paphos Lighthouse, the Cypriot Acropolis offers numerous archaeological attractions, including the restored Roman Odeon and the remains of a Roman temple. Possibly the greatest attraction of Paphos is the collection of ancient mosaics found at sites around the city. People can see some examples of these ancient works of art at the acropolis. It's definitely also worth making time to visit the Roman noblemen's villas where the best examples of mosaics can be admired. 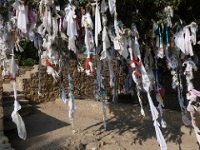 Two special monasteries close to Paphos are popular as quick excursions out of the city or as a stopover when seeking out one of the gorgeous beaches in the area. The Ayios Neophytos Monastery is a great spot to enjoy some peace and tranquillity away from the bustle of the city, and the Chrysorrogiatissa Monastery has the added attraction of producing its own wine, made onsite by the monks. Paphos is surrounded by lovely landscapes and attractions like the Rock of Aphrodite; a great spot to enjoy a beautiful swim. There are also a number of attractions in Paphos that capitalise on the mythical significance of the area, like the famous Baths of Aphrodite.